Liaquatpur, a small village 110 kilometers away from Rahim Yar Khan had been a beautiful drive along ripe mango fields and expansive green fields on both the sides. As the day progressed and I entered my last school for the day’s field visit, I did not foresee what I was about to observe. I visited an enthusiastic pre primary class of 64 children at Government Primary School Darhi Sangi, I was awe struck by the performance of the students on all learning levels of Urdu, English and Math . Students were outperforming in this class as compared to all the other schools I had visited previously. Then I was introduced to the Para Teacher, Haseena Bibi, who was an ITA appointed teacher for Out of School Children which had been enrolled as well as those children in school but at the risk of drop out. Haseena Bibi was confident and patiently answering all my queries for the field visit. I stayed back till late after school so that I could have a conversation with Haseena Bibi regarding her job well done. The story of Haseena Bibi is pretty simple as she puts it. However the impact she has created is worth noting for educational practitioners around the country. It had been nine years since Haseena Bibi started teaching in her village and has been a part of many development projects in the capacity of a teacher. Her Husband is a ‘rickshaw’ driver and she has no children. The students at school are her children as she puts it. Haseena Bibi joined ITA back in August of 2015 during commencement of ITA’s ‘Chalo Parho Barho’ camps in our selected schools in Liaquatpur. I asked Haseena Bibi about her relationship with the children and she told us that, “I don’t maintain a strict relationship with my students. Often so they even call me ‘baji’ (sister) accidently because I’m so friendly with them. However, I make sure they learn etiquettes and follow them." We also asked Haseena Bibi about what should be done to better the education system. She answered, “The Sports, Reading, Science and Health Kits provided by ITA really helped. It gives an incentive for little children to get up and come to school every day to play and read with it; even the smallest of incentives can make a huge difference in educating more children.” We learned from Haseena Bibi that provision of proper incentives such as the Teacher Learning Materials facilitate teachers along with the formal curriculum. 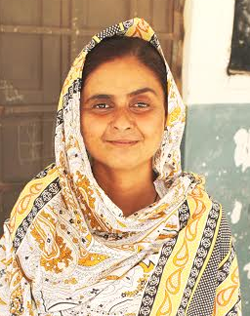 Haseena Bibi’s classroom wasn’t just another classroom in a remote village. The 64 children along with Haseena Bibi have set a precedent on lessons of equality, empathy, incentivized learning, conceptual and quality education. We are proud to have Para Teachers such as Haseena Bibi a part of the ITA family; working on the ground and making the change possible.